This is what Fiddler (Forest Whitaker) tells Kunta Kinte (Malachi Kirby) on Christmas day, as a means of distracting their white masters while Kunta tries to escape, but it really could be a thesis statement for much of the music enslaved Africans performed and created. It’s a vital statement for the new version of Roots to make because music plays a central role in portraying Kunta’s forced journey from Gambia to Virginia. There was much to like in last night’s premiere installment but, as a music historian, this aspect resonated with me, so I’m going to explore it a little here. I’ve never seen the original Roots (that’s why I was happy to have Glenn Brasher review it last week), nor have I read the book, but I knew about the character of Fiddler. In retrospect, it seems obvious that music would play a major role in the narrative, given Fiddler’s entire identity is wrapped up in his status as the plantation musician. What’s more, the music he’s mastered is European, not African, and thereby serves as a ready symbol for both his submissive attitude toward whites and his willing appropriation of English culture. Encountering Kunta disrupts Fiddler’s worldview and much of that disruption is caused by and expressed through music. Kunta’s story up to that point is dotted with musical moments. The action doesn’t leave Gambia for the episode’s first quarter and we see music and dancing as a vital part of Mandinka culture. In addition, singing is a major aspect Kunta’s warrior training, as his fellow soldiers use songs to motivate themselves and pass information. By the time Kunta is captured, musical performance and reception are well-established aspects of his experience. Music takes an even more prominent role in the narrative once Kunta begins his Middle Passage to Virginia. At first silent and despairing, Kunta and his fellow captives begin singing in much the same fashion he did as a warrior—both to find strength and communicate ideas. The latter is especially important now, as their English captors do not know the Mandinka language, so the male and female captives (segregated to different hulls of the ship) begin singing to each other to learn more about their situation and, eventually, plan a revolt. One of the best scenes in the episode is when the male captives are brought out on the deck and forced to dance so that they might stay limber. They refuse at first, but later appear to appease their captors and start singing. Now closer to their female counterparts, the men are in fact working out a plan to seize the ship. The revolt fails, but Roots accurately establishes the complex role music played in slave life. For these 18th Century captives right through to runaways in the Civil War, music was a way to simultaneously appear submissive to whites while actually voicing opposition to slavery. Thus, by the time Kunta reaches Fiddler’s Virginia plantation, music has become a tool for coping with enslavement, but it’s also an important link to life in Gambia. The first non-soundtrack song we hear is a lullaby Kunta’s mother sings to him after his birth. Enslaved in Virginia and under Fiddler’s tutelage, Kunta sings it and elicits an immediate sympathetic reaction from Fiddler. Up to this point, Fiddler’s relationship with Kunta has been mostly contentious. Fiddler cannot understand why Kunta won’t accept his enslavement and take his new name, “Toby.” When Kunta sings this Mandinka song, Fiddler recognizes it from his own infancy and is immediately brought to tears. It’s a direct link to their shared African heritage and alters their relationship from one of Fiddler as an extension of their master’s authority, to a mutual partnership navigating the hardships of slave life. The runaway scene depicts Fiddler’s transformation directly through music, as his promised Christmas performance for the master’s family begins with English music but transitions into the Mandinka lullaby, signalling Kunta to make his escape. As with the songs on the Middle Passage, this is an overt use of music to both culturally and physically rebel against the slave system. 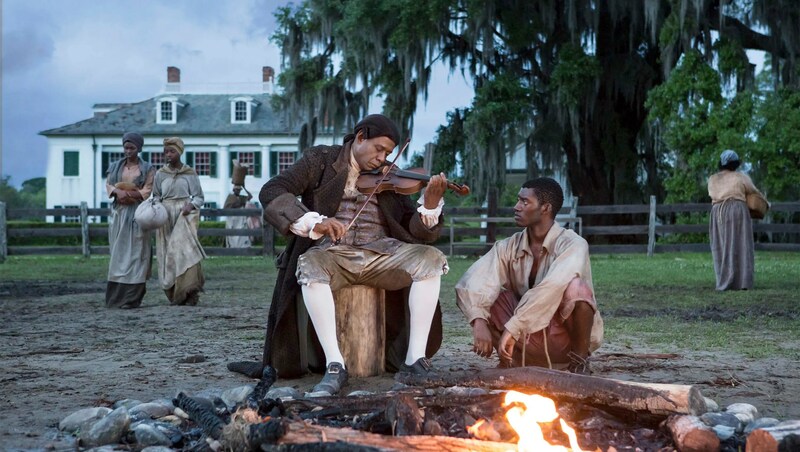 Kunta’s attempt to physically escape slavery fails and he takes the name Toby, but it’s through music that he and Fiddler maintain their connection to each other and their homeland. Over time, enslaved African Americans would adopt a musical style that combined African and European musical and religious traditions, but its function largely remained consistent—providing a way to maintain their own culture outside of white America and to communicate otherwise rebellious ideas in a way that seemed harmless to their masters. I wonder if music will remain as central to the narrative as Roots progresses. At one point, Fiddler mumbles that his interactions with Kunta may inspire him to make an “African guitar.” This reference was surely to foreshadow the eventual influence of African American music on American music generally. I was especially impressed with the amount of screen time this new Roots gave to Kunta’s life in Africa and the way slavery hovered around the edges of that life before it finally claimed him. As Glenn noted in his review, the previous adaptation introduced white characters early to try to attract white audiences,but the new series goes over 30 minutes before we see a white person and, even then, the white characters are always distant and largely unknowable. It would have been nice to see as much of the broader slave culture around Kunta and Fiddler as we saw of Kunta’s Mandinka village, but it looks like we’ll get more of that in the second episode. It’s my goal to write a review of the whole series later this week but I’m heading to the Society of Civil War Historians conference in Chattanooga on Thursday, so that might be a tall order.